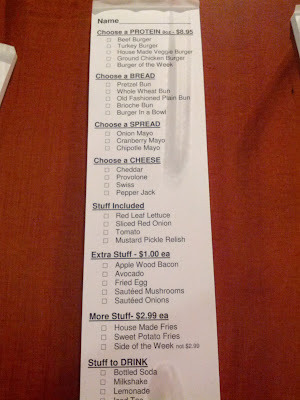 Hungry Kat: Best Burger Under $10 Alert! Hole in the Wall Reopened! Best Burger Under $10 Alert! Hole in the Wall Reopened! Philly Cheese Steak Burger of the Week @ Hole in the Wall Burger Joint. I've heard a lot about this joint and I finally got to try it last week in its newly reopened location in Santa Monica (across the DMV, by the Water Garden). One word: AMAZING. My burger was the perfect marriage of a medium-cooked beef patty, thinly-sliced steak and melted provolone cheese bound by a heavenly pretzel bun. I admit my Burger of the Week was a little messy to eat and my friends who ordered regular beef and turkey burgers didn't have to go through three napkins like I did but it was totally worth it every time I sunk my teeth into all that juicy goodness. You go in and they have a list for you to put together your burger. Grab a pencil and start ticking off your delicious burger journey. The list of choices may seem short but don't let that fool you because the chef has given you his careful selections. They work! Don't forget those fries and if it's a Friday, treat yourself to a milkshake or cupcake for surviving the week. Then give the list to the cashier, pay and in less than 10 minutes, you'll be enjoying one of the best burgers in Los Angeles. One visit to Hole in the Wall and it was enough for me to come to the conclusion of what I've suspected all along. 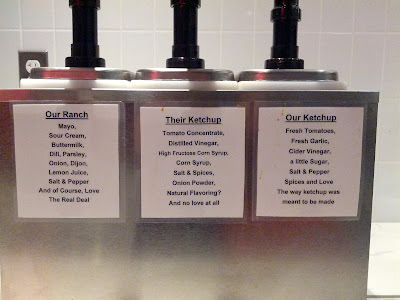 The more ubiquitous Counter Burger gives you a gazillion choices to put together your burger but no matter how much thought you've put into it, somehow your carefully put together ingredients will still result in the same mediocre taste. And that is regardless of how you've changed your cheeses, sauces and toppings. Sadly, the Counter Burger also tend to overcook their beef patties even when you order it medium or medium rare. Between Hole in the Wall and The Counter Burger, I would choose Hole in the Wall any day. They use never-frozen grass-fed Angus beef, source their breads from a local bakery (more on that awesome bakery in my next blog post) and make their own spreads and ketchup. 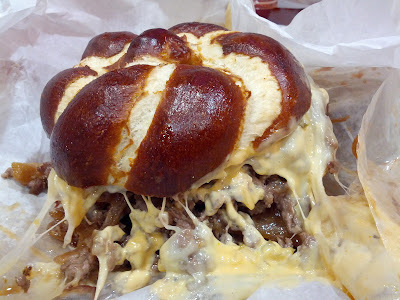 That soft pretzel bun alone is worth driving to Hole in the Wall for. Parking tip: Metered street or 2-hr free at Arboretum Plaza, entrance on Colorado Ave., right off the Starbucks.